I knew nothing about kimchi until Dave presented me with a jar of his home made version. Well, it was delicious, bright red, more-ish, crispy and swiftly became an addition to a lot of my meals at home. It easily spices up what could otherwise be boring, or lifts some delicious to another level. Kimchi is a fermented vegetable side dish predominantly made with napa or Chinese cabbage, a lot of garlic, ginger and various other ingredients. It’s one of those things which I imagine one discoveres their ‘perfect’ kimchi recipe depending on the spice you like, the garlickyness, the ratio of vegetables etc. Importantly there is a ‘World institute of Kimchi’ which I read about here. This meant that for getting quantities I used a mixture of both of these. I also had pinned (on Pinterest) a load of recipes and read up a bit before. Ultimately I didn’t stick to one recipe and after some discussion with Dave had come to the conclusion that kimchi is quite forgiving. Garlic – a lot! Maybe 8 cloves? Get your equipment ready first. If you’re doing a large volume of cabbage (like I did) I would highly recommend getting a large bucket or storage box to put it into. It takes a lot of room up when freshly chopped (but shrinks as the process goes on). I found it pretty annoying having to have two large bowls almost overflowing with brine and having to swap between lots of bowls. 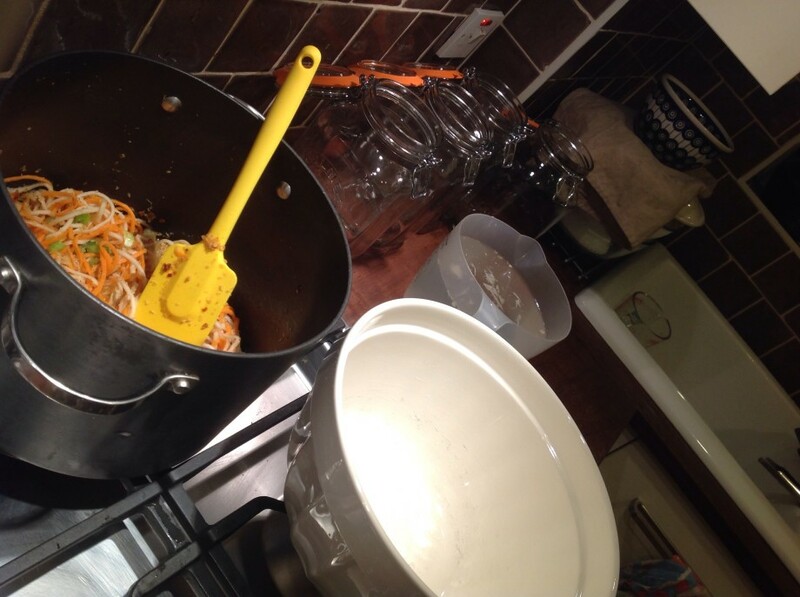 After my tonic water disaster (it went cloudy before I’d even had the chance to try it) – I read up a little on sterilising the containers I intended to keep the kimchi in. I used the method of putting the jars in the oven at 275°F/130°C/Gas 1 for about 20 minutes and boiling the rubber seals for a few minutes. Once that was done I was on the chopping path. First I removed the outer layer of sadder looking leaves from the cabbage. Then I quartered it, took out the heart and chopped it into inch wide chunks. I dissolved one cup and a bit of Malden sea salt in cold water in two large bowls. 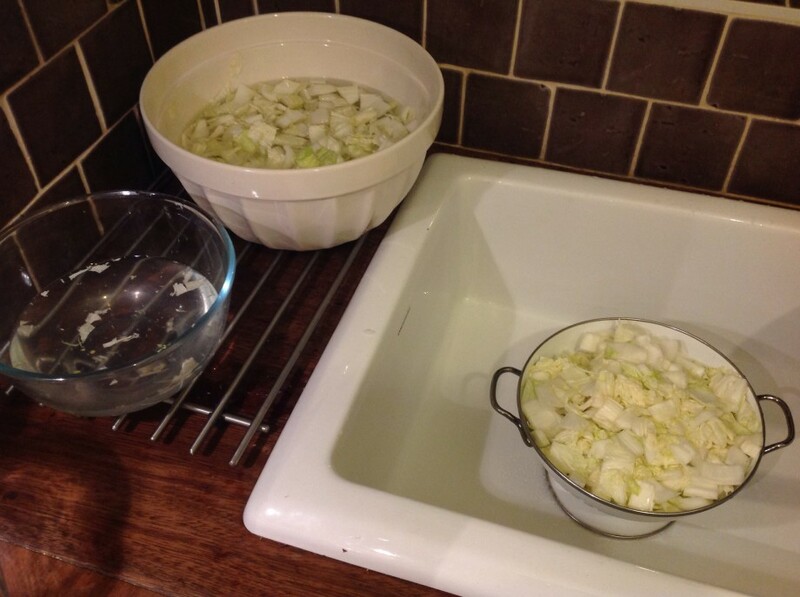 All the cabbage was put in the bowls which I then weighed down with a plate and tins of things. The salting time was going to be two hours. So whilst waiting I prepared the rest of the vegetables. I chopped the spring onions fairly randomly and then I used my new favourite kitchen tool, the julienne peeler, to shred the carrots and mooli into long, thin strips. In a mini food processor I chopped up the garlic, ginger and dried chillis. 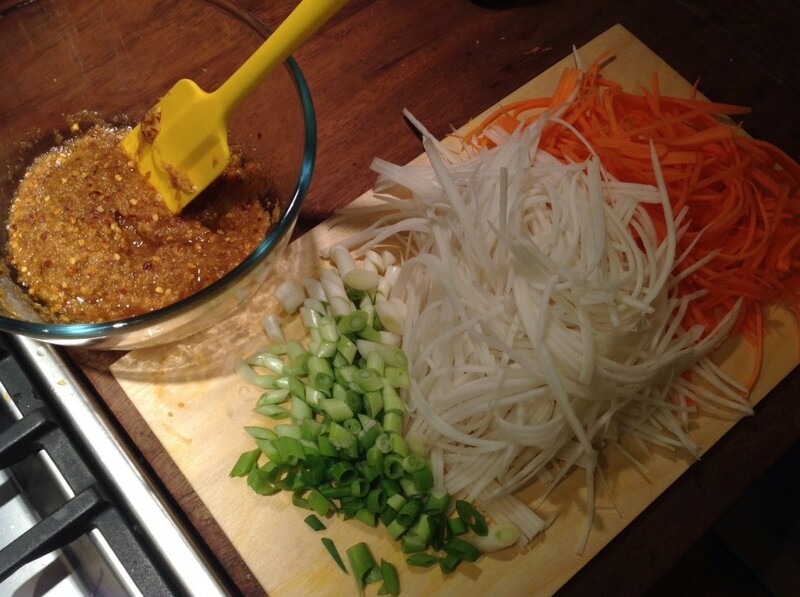 To this I liberally added soy sauce and fish sauce. Once the paste was ready I mixed this with the unsalted vegetables. Then became the draining, rinsing, draining, rinsing process. I had to work through the cabbage in stages. When it’s been salted it has reduced in volume quite a bit. Here I started adding handfuls of the cabbage to the rest of the mixture. Once it was all mixed through I filled the two jars with kimchi. Whilst draining I kept some of the brine as when the kimchi is jarred it needs to be covered with the liquid. I had to make a little extra as I became paranoid whilst it seems to disappear a bit after the first couple of days. 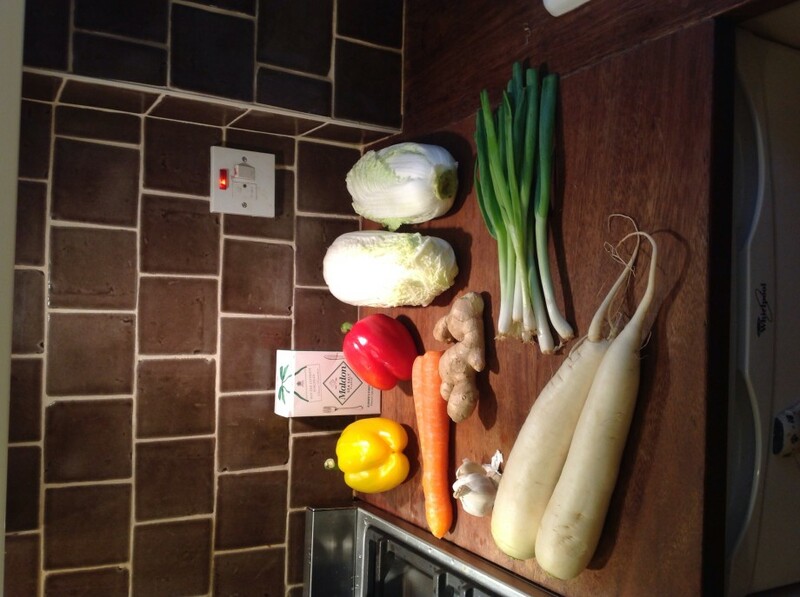 And I am annoyed by the lack of red colour – I think next time I will buy the Korean chilli pepper. Anyway. The first 72 hours of kimchi sitting in the kitchen meant The Jim and I sitting in a very garlicky perfumed flat. In the end I put the two jars in the oven to reduce the smell. They have since been sitting since Sunday 16th March. Now for bravery and trying the stuff. Report to follow. The red colour really is more cosmetic than anything, I’m sure it will taste just fine. 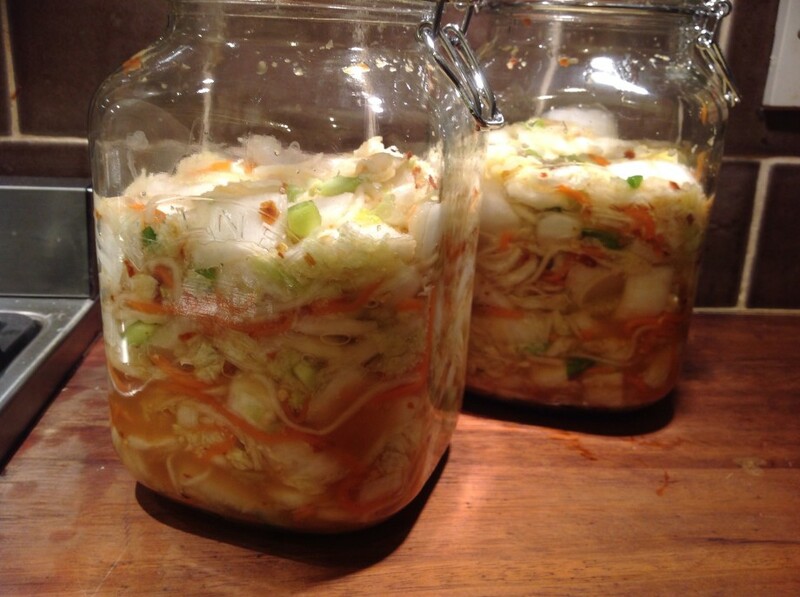 Sterilising the jars really isn’t quite such a big deal for kimchi as it might be for the tonic water though. Basically, the good bugs quickly kill off the bad bugs in fermented foods like kimchi. So long as you keep the vegetables below the surface of the liquid, you’ll be just fine. Anyway, please do post a followup once the kimchi is ready. Meanwhile, your next challenge is all written up and waiting – I shall post it tomorrow.